Beautiful Orvieto, with its grand Gothic Duomo and imposing position (perched atop soaring cliffs), is perhaps Umbria’s most enticing city. 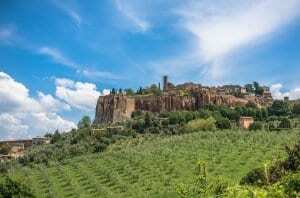 Located in southeastern Umbria, near the border with Lazio and the shores of Lake Corbara, Orvieto sits on a plateau that rises high above the green fields and vineyards blanketing the landscape nearby. Only an hour north of Rome, it’s a city famed for its cuisine and its crisp, white wine, making it an ideal destination for food and wine lovers. Orvieto is a “must see” on your food and wine tour of Umbria. Stop here to visit wineries, pick up gifts and goodies in colorful foodie shops and dine at the city’s best eateries (like I Setti Consoli, Osteria dell’Angelo and Il Giglio d’Oro in Orvieto town and the mythical Vissani nearby). Orvieto’s roots date back nearly 3,000 years to the Etruscans, who first occupied this site in the 9th century BC and called their prosperous city Velzna (or Volsinii). This city was destroyed by the Romans in 254 BC although was later rebuilt. After the fall of the Roman Empire, it became a Christian hotspot and became home to many convents and monasteries. In the 11th century, the religious-leaning Orvieto became a city-state. An era of wealth and privilege began, with many palaces, churches and defensive fortifications being built. Wealth doesn’t necessarily bring peace, however; later centuries were marked with a long-term struggle over papal power, although eventually in 1354 the city was subjected to papal rule. It later became a provincial capital of the papal state before becoming part of the Kingdom of Italy in 1860. No one comes to Orvieto without spending time in its richly decorated Cathedral (or Duomo). Built in the 13th century to honor a relic found nearby, it boasts a splendidly decorated façade packed with mosaics and sculptures depicting Biblical characters and scenes. Inside, the magic continues with lavish chapels and a wealth of sacred artwork. Beyond the Cathedral doors, the maze that is central Orvieto hides stately palaces, churches, monasteries, and convents. It would be impossible to visit them all, but highlights include Saint Andrew’s Church (12th Century), Saint Domenic’s Church (12th Century) and Saint Giovenale’s Church (11th Century). Also fascinating is the evocative underground Orvieto, a labyrinth of tunnels, caves, galleries, wells, and rooms that were dug out of the rock foundation underneath the city; you can explore them with Cellar Tours on a private guided tour. The best-known part of underground Orvieto is the Pozzo di San Patrizio (Saint Patrick’s Well), a deep well lined with spiraling ramps built so that donkeys could descend down to the water below. The city is also famous for its ceramics; the tradition dates to the days of the Etruscan city of Velzna, whose economy was based largely on ceramics. The white wines made near Orvieto were earning praise as far back as the Middle Ages when thick, sweet creations were served to the Popes who came to summer on the shores of Lake Corbara. These days, the city is the epicenter of the Umbrian wine business, with some 70 percent of the region’s DOC production coming out of the area surrounding Orvieto. The syrupy creations of years past have been replaced with clean, crisp wines with hints of fresh fruits like melon and apple and a slightly minerally finish. Quintessentially Italian, these tend to be light, refreshing wines that are easy to drink and can often be described as “dewy”. Orvieto dishes include garbanzo-chestnut soup and mazzafegate (sweet or savory sausages). Regional specialties include Olive Oil (Umbria is one of Italy’s premier olive oil producers) and dried pasta, which comes in an endless array of shapes and sizes. 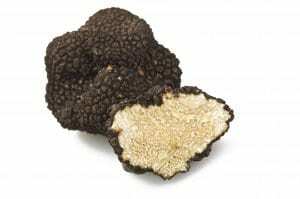 Truffles from Norcia (another Umbrian hamlet). Begun in 1285, the ornately adorned Duomo of Orvieto is the city’s main attraction and is one of the most impressive in Italy. The volcanic rock that serves as Orvieto’s foundation is riddled with tunnels, some of which date to the Etruscans. The most interesting is the 16th-century Pozzo di San Patrizio, a deep well with a spiral staircase leading 62m down to the water. With a rather simple façade in comparison to other constructions in the city, this 12th-century palace was the site of meetings of the People’s Council. Ancient ruins are found in and around Orvieto. You can still see the remnants of the defense wall that circled the city thousands of years ago, and you can visit Crocefisso di Tufo, an Etruscan necropolis with dozens of tombs. The maze of tunnels and caves found underneath the foundations of Orvieto offer a fascinating glimpse into a long-hidden part of the city’s past. You can explore them on guided tours. Saint Andrew’s Church (12th Century), Saint Domenic’s Church (12th Century) and Saint Giovenale’s Church (11th Century) are just a few of the beautiful churches found in Orvieto. The interesting archaeological museum (aka Museo Claudio Faina e Museo Civico) is worth a quick visit, especially if you’re interested in Etruscan history and art. Also worth your time is the Museo Emilio Greco, which showcases the work of the contemporary Sicilian artist whose works adorns the modern doors of the Duomo. A massive construction begun in the 14th century and standing on the Piazza Cahen, its original purpose was to ensure that the church had a safe place of refuge in the event of an attack.